A newspaper article on the history of the Sanford-Oviedo Truck Growers, Inc. Sanford-Oviedo Truck Growers was founded in 1913 as a cooperative growing and shipping organization originally consisting of fourteen growers in Sanford and Oviedo, Florida. The company was also one of the first vendors to lease stalls at the first Sanford State Farmers' Market when it first opened in 1934. 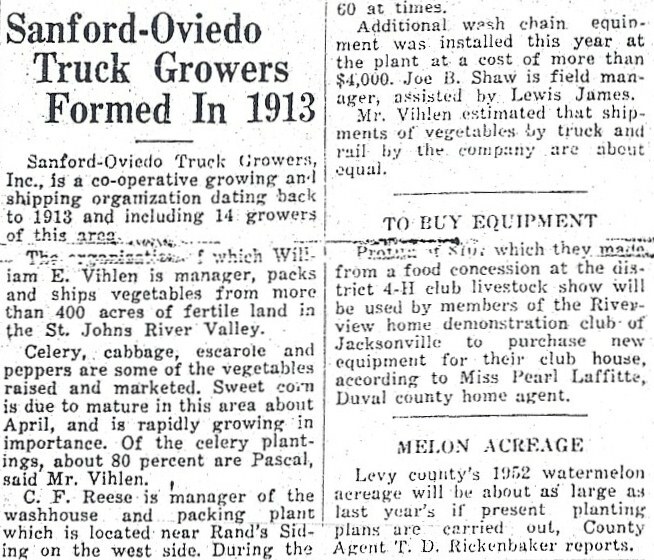 At the time that the article was written, the Sanford-Oviedo Truck Growers was packing and shipping vegetables from more than 400 acres of land in the St. Johns River Valley under the management of William E. Vihlen. The company distributed mostly celery, with 80 percent being Pascal, but other vegetables shipped included cabbage, escarole, and peppers. The company's washhouse and packing plant located near the west side of Rand's Siding was managed by C. F. Reese and received additional wash chain equipment costing $4,000 in 1954. According to the article, Joe B. Shaw was the field manager and Lewis James was his assistant. The article also includes two snippets about a 4-H club livestock show in Jacksonville and the watermelon harvest for Levy County in 1952. 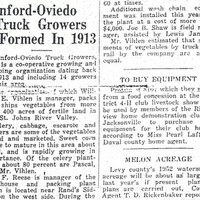 Original black and white newspaper article: "Sanford-Oviedo Truck Growers Formed in 1913." February 25, 1952: Museum of Seminole County History, Sanford, Florida. Digital reproduction of original black and white newspaper article: "Sanford-Oviedo Truck Growers Formed in 1913." February 25, 1952. “Sanford-Oviedo Truck Growers Formed in 1913.” RICHES of Central Florida accessed April 22, 2019, https://richesmi.cah.ucf.edu/omeka/items/show/3021.